It wasn’t a competition, but clearly, he won. 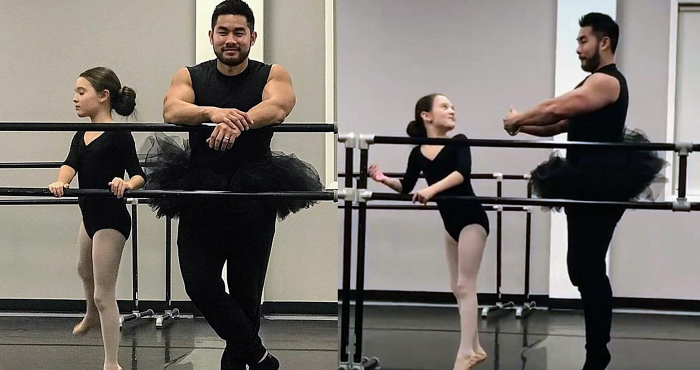 When Thanh Tran’s daughter’s ballet studio hosted Parent’s Night, the girl asked him to participate. She would have asked her mom, but as the woman was 7 months pregnant at the time, dad was the smarter choice! She asked him to dress up and even gave him a tutu to wear! She takes her studies very seriously…and having dad see just how hard she works during class was a memory that she’ll not soon forget! Not gonna lie, my calves and toes were cramping up!” He wrote on Instagram. The other parents who showed up for class hadn’t dressed up, and there was only one other dad in attendance…but he didn’t care! He was there for her 100%. He dressed up, followed along, and did his best all with a smile on his face. He wasn’t about to be embarrassed or bow out of the event because he knew that his daughter’s opinion was the only one that mattered. The adorable story really resonated with other parents who hope to be just as inspiring to their own kids…and reminded even more people of their own parents who did things just like this while they were growing up! Too sweet!